National Geographic Children's Books, 9781426333163, 32pp. Little Larry is an orphaned chimpanzee who doesn't know much about being a chimp. He has to go to his first day at the forest school to learn what chimp life is all about. 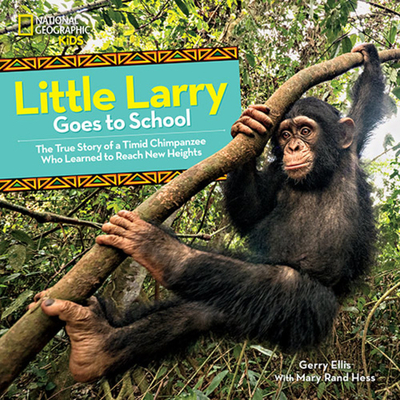 Nestled in a primate sanctuary in Cameroon, Little Larry and his group of chimp friends go to the school each day to learn how to play, communicate, and climb like they would if they were chimps in the wild. The only trouble is, Little Larry doesn't want to learn how to climb. He's perfectly happy on the ground. Will the sanctuary keepers and other chimpanzees be able to teach Little Larry how to climb so he can graduate from forest school? GERRY ELLIS is a wildlife filmmaker, photographer, and writer, whose work has appeared in National Geographic, BBC Wildlife, New York Times, Ranger Rick, and more. His work is now featured in the YouTube channel Apes Like Us, which he also hosts. Ellis is the author of more than a dozen children's books. Documenting nature for more than 30 years inspired him to found GLOBIO, a nonprofit that inspires children to protect all life on Earth. MARY RAND HESS is a poet, mixed-media artist, screenwriter, and New York Times bestselling author of Solo, Swing, and Animal Ark: Celebrating Our Wild World in Poetry and Pictures, all coauthored with Kwame Alexander. She currently lives in California with her husband, sons, and two quirky dogs, where she is hard at work on a few books and screenplays.